The English word "worship" comes from two old English words "worth", a value, and "ship", meaning quality. Combining the two words means to declare worth or value or to praise. If you are looking for word meaning, worship is to declare worth, adoration, praise, or reverence to God. As I grew up in church, my perception of worship was that it was more of a place. I viewed worship as being at church and singing hymns but, you did this without bringing attention to yourself. It seemed it wasn't proper to clap, raise your hand, or dance in your seat. To me, it seemed it was more about showing a quiet reverence so as not to be a distraction. It was those notions and routines at church, a lack of understanding of who God was, and my attitude that was limiting my understanding of what authentic worship of a holy and perfect God was - for me. When I was younger, my family discovered that I had some vocal capacity to hold a tune. I would sing a solo every now and then and sing occasionally in the choir for the annual Christmas and Easter Cantatas. But, if I am completely honest with myself, those times I sang solos at church or in the choir it was more for me... not Him. I allowed myself to be more concerned with whether or not people liked my "performance" than whether or not it was pleasing to God. My pride and concern for pleasing people got in the way from understanding true worship. And I sure wasn't going to make a spectacle of myself by raising my hands or clapping to the beat of a song! I didn't want anyone to think I was weird, or anything! My perception of worship was not honoring God. 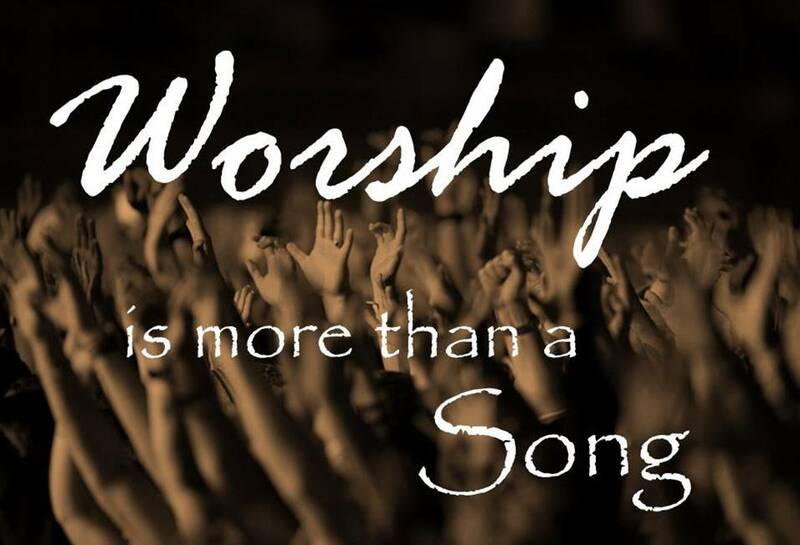 Worship is more than word meaning; more than a place, more than singing a song. It is a state of spirit - an attitude. It is our daily expression of praise and adoration through our speech and actions. 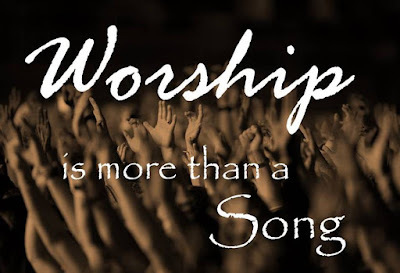 Worship is an expression of how much we love the Lord with our heart, mind, and soul. (Matthew 22:37) That expression of love for God, for me, was... shall we say.. lacking. So, if worship is an attitude - an expression of what we think, say and do, shouldn't worship be present in more than just being at church once a week and singing songs? For a long time, I had spiritual heart blockage (and sometimes still do), which cut the spiritual blood flow to my brain, and limited my spirit from knowing and understanding the fullness of God. I have shared some of my story with you in previous posts, so I will spare the details here. But I ask that all of us think about where we are in our relationship with Jesus. Are there things in our lives that are blocking our ability to encounter God in a way that prevents us from expressing our complete and uninhibited adoration for Him? God had to show me how messed up I really am. The Holy Spirit convicted me and I realized that I wasn't singing for God, I was singing for myself so, I stopped singing at church for a long time. I couldn't keep singing praise and worship songs about God, when I knew I was not living the life I should. God was revealing to me that I needed a heart change first. The gift God gave me was not giving Him the glory, because I was taking it. There is a quote I took away from reading the book, Wild Goose Chase by Mark Batterson. He said, "We can't appreciate the full extent of God's grace until we realize the full extent of our sin." Based off of my own experiences, I believe that is so true. It wasn't until God rocked me to the core that I really understood the love and grace of God. That is when my heart opened up and I desired to express a more authentic worship. I didn't deserve it! I realize that I am a messed up sinner in desperate need of God's love and grace - to which He offers freely to me - and to you! One day, God opened the door for me to sing again. I was fairly worried at first about what I sounded like, looked like on stage, and if I was hitting the right notes. I started focusing on the wrong things. As I have grown in God's grace and love, that feeling of fear and doubt of my "performance" has dissipated. God is opening my eyes and filling my heart. I seek to know him with everything I have and I can't help but give all of myself to worshiping Him! Hands raised and clapping! I have had the absolute pleasure of being able to sing with our praise and worship team at Stonepoint Church for the past three years. Some of you have had to endure my "vocalities".... and because of this, I want to offer my sincere apologies for any moments of painful auditory stimulus! I still worry about hitting the right notes but NOW my focus is about encountering God. I used to feel so inhibited during Sunday worship time at church. But, as my love for Christ has grown, I raise my hands and sing in complete and uninhibited praise to my God and Savior who saves me from death! Jesus Christ is my redeemer who cleansed me from my sin. He has taken my place on the cross and given me life! Although I appreciate the occasional "good job" and pat on the back from my brothers and sisters, I'd rather hear praises to God. I pray more than anything that God get's ALL the GLORY! It's all about HIM! It's not about me! My love for my Savior and my time with him during our Sunday worship time fills me with such a joy. I pray for those worshiping with me feel that joy too. Not only while we are together on Sundays, but when we all sing praises to God in our daily worship. I can't tell you the joy I have in my spirit simply "being the church" with people who are completely committed to God and confidently lift their voices and hands to Him in praise. 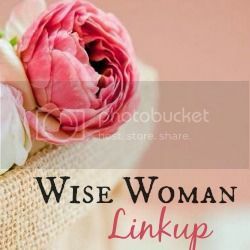 Paul says in 1 Corinthians 14:15, "I will pray with my spirit, but I will also pray with my understanding; I will sing with my spirit, but I will also sing with my understanding." Let us remember that everyday is a chance to glorify God through our worship. It's not about us.... it's about expressing the love we have of a Sovereign God, His Son, and the Holy Spirit. People express their worship in many ways. Raising hands, clapping, dancing, or jumping around doesn't make you more or less holy, reverent, or in love with God than anyone else. It's not about a performance or an outside appearance. Each individual is led to worship the way the Holy Spirit convicts them to worship. It's about what we have in our heart and our understanding of the relationship we have with our Savior. When people who don't know God recognize the difference in our DAILY lives and how we express that love through our daily walk in worship with God, that's when others become inquisitive. That's when we are a witness... a witness through our daily worship. On the Sidelines, or in the Game? I am a COMPLETE MESS!